Slovenia is a paradise for outdoor lovers. And while it definitely offers challenging adventures like climbing 2863 metres high Triglav, highest peak of the Julian Alps, it also offers quite some easily accessible yet breathtaking natural wonders. Like Postojna Cave, Skocjan Caves, Lake Bohinj or Lake Bled. We’ve already praised Triglav National Park, Slovenia’s only and amazing one in several posts but this time we want to highlight the easiest hike we’ve done there. But you bet it’s a very pretty one! 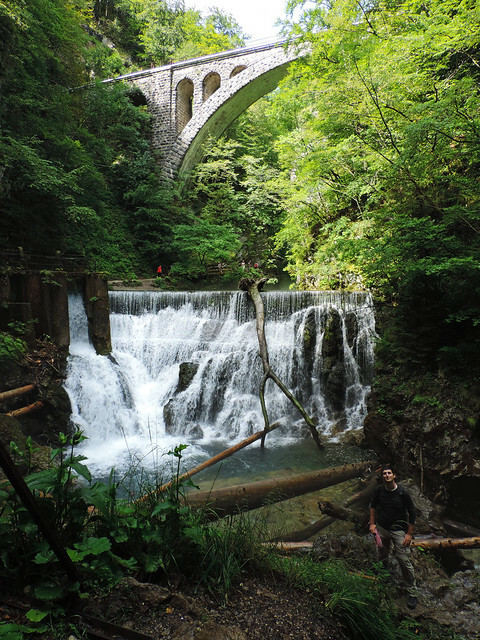 Why is Vintgar Gorge so special? 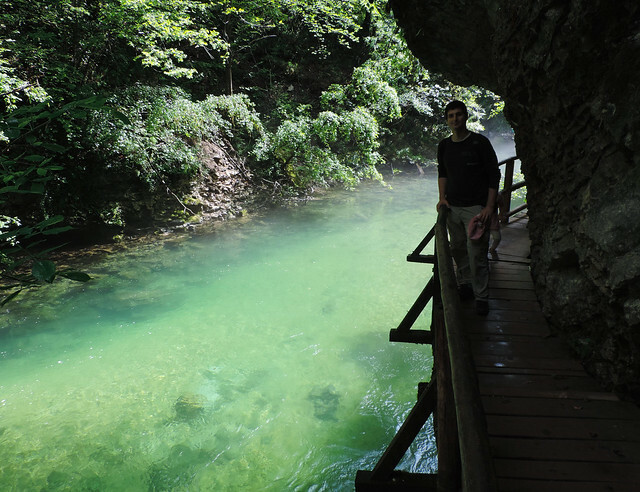 Now let’s finish rambling and talk business: the place is called Vintgar Gorge and it’s located just 15 minutes drive from Bled. Imagine a narrow canyon carved out by a fast and perfectly emerald green mountain river with its walls rising to 50-100 metres high around you. Now add a wooden walkway in the canyon, some charming little bridges over the river and occasionally rapids, waterfalls and pools on your way. 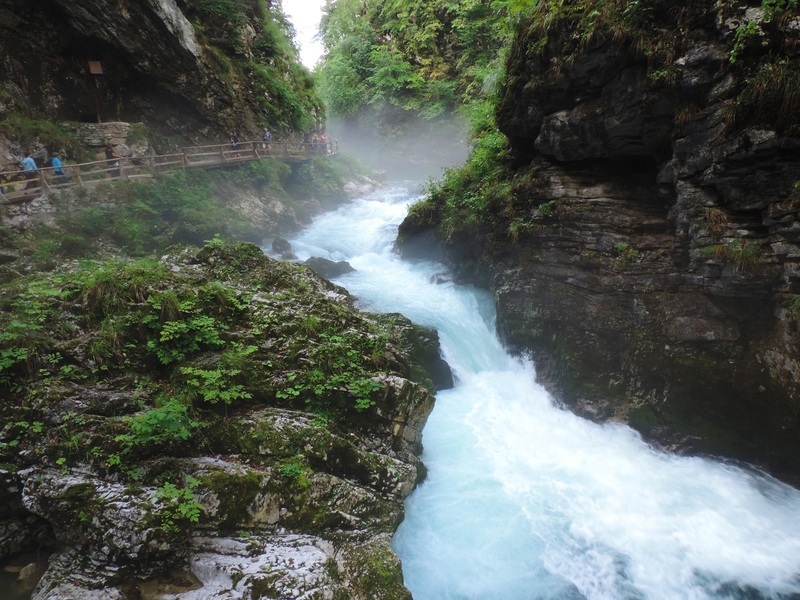 That’s Vintgar Gorge in a nutshell. The series of wooden walkways and bridges make the canyon of Radovna River very easy to explore. You may even argue whether we could call it hiking or it’s rather just a walk. Anyway, it’s an amazing 1.6 kilometres long route that ends at the 16 metres high Šum Waterfall. There’s a snack bar at the end of the canyon, too, but we just found our perfect place for having snacks on the huge rocks in front of the waterfall. And it’s also a place worth getting up early for! 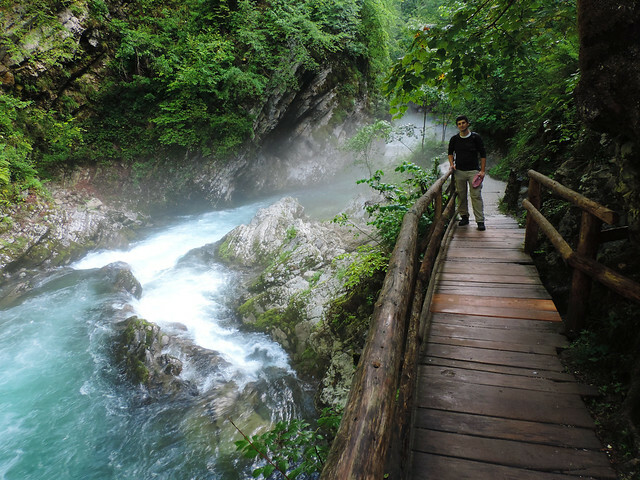 Seriously, Vintgar Gorge is VERY popular. Especially if you visit in the summer like we did it’s worth getting there by 8 – the time when they open. Around that time we were able to find a free parking spot easily and we only waited 10 minutes in line to pay the entrance fee. This was not the case however when we arrived back to the parking lot around 11 am. The lot was full and people had to stand in line at the entrance for at least an hour. Not to mention traffic on the walkways. So the most important thing to keep in mind if you want an enjoyable visit to Vintgar Gorge: start your day there and start your day early! Lake Bled will still be there for you later in the day. The gorge is open from 8 am to 7 pm every day and there is an entrance fee – 4 EUR for adults at the time of our visit (2016 July). Parking is free at the entrance however it’s limited. 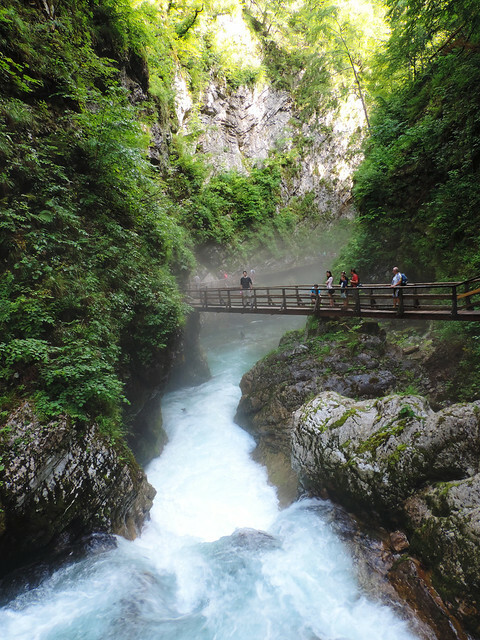 Vintgar Gorge is a perfect half day trip if you visit Lake Bled. It can be reached in 15 minutes from Bled by car. You can even walk or bike there from Bled; the distance is about 4 kilometres. 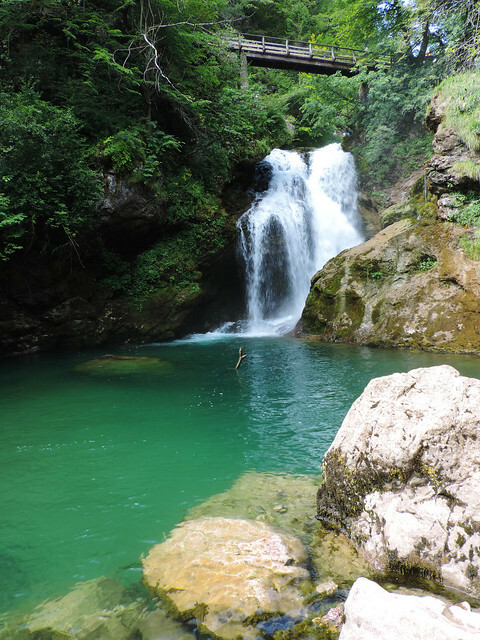 Another lovely and easy hike nearby is Peričnik Falls; it’s about 40 minutes drive from Vintgar Gorge. 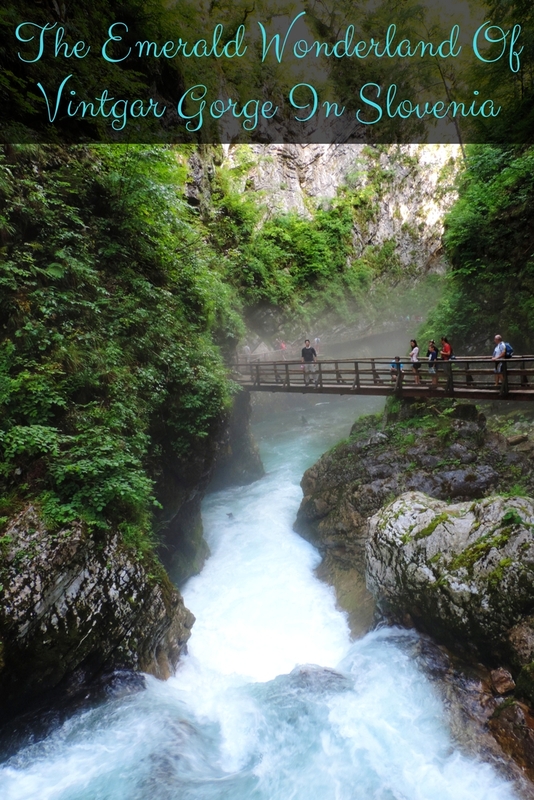 And if you think that Vintgar is the only beautiful gorge in Slovenia we recommend you to check out Tolmin Gorges in the Soča Valley. It’s a similar but lesser known gem. Do you have a favorite hike in Slovenia? Does it seem like a place for you?